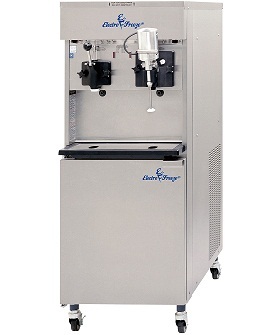 Two products (Soft Serve Ice Cream and Shakes) in only one machine for maximum menu flexibility! This pressurized machine produces high-quality, high-volume soft serve and shakes in one footprint. The shake side features a dispense-head-mounted mixer that blends flavors and/or crumb toppings into the shake product as it is dispensed, producing a high-quality, hand-made shake consistency. The fast, easy way to serve flavors regardless of the viscosity of the flavoring syrup or the fruit pulp it contains.. The single-flavor soft serve is great for high-volumes of cones and sundaes. This machine is perfect for QSR’s that want speed of delivery with the highest quality shakes and ice cream available!